It sounds like Alison had another good day with her brother and sister-in-law. They reported she was in pretty good spirits and did really well in her physical therapy session today. During that session she showed some new movement in her left leg that we hadn't seen before. While sitting in her chair, she had already been lifting her left leg up a bit. But today she began extending her leg almost completely straight out - bending at the knee. She did this a number of times repeatedly upon request, so that was very encouraging to hear. I'm eager to see it for myself when I go up for the weekend. 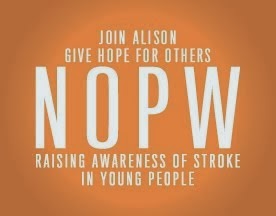 I have a meeting at 8am tomorrow with the front running facility for Alison. It's in Shawnee and the people sound very caring and interested in helping us out. I've not seen the facility, but am cautiously optimistic this might be the place for Alison to spend a bit of time before we're ready for the next stage. Thanks in advance for your positive thoughts and prayers for that meeting to go well. I'm planning on a transfer from Lincoln to KC on Monday, so hopefully we'll have everything figured out by then.